Bridge mode is the simplest solution to integrate nEdge into an existing network. The LAN interface is the interface which will face the clients to protect. The WAN interface is the interface to the outside world, usually to the internet gateway. This logical division allows nEdge to properly identify the clients to monitor (on the LAN interface) without affecting the rest of the network (on the WAN). 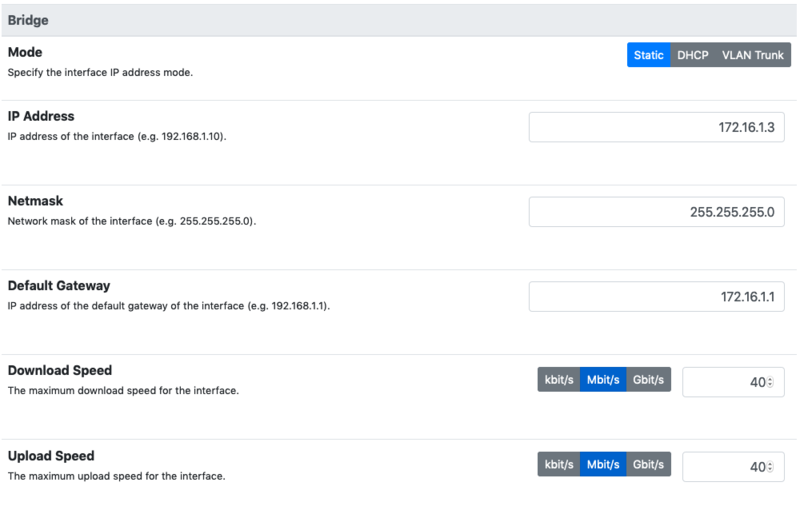 nEdge can be either configured to automatically acquire an IP address in DHCP client mode or a manually assigned IP address can be provided. Usually a DHCP server is already available in the network so automatic configuration can be applied. nEdge can also bridge interfaces with VLAN-tagged traffic when it is configured as a VLAN Trunk bridge. In VLAN Trunk mode, it’s necessary to specify the list of local networks by manually editing the file /etc/ntopng/ntopng.conf via the -m option. Policies will only be applied to local hosts, so this is very important. See the ntopng documentation for more details. The switch port connected to the administrator eth0 interface must be tagged with the same VLAN id configured in the nedge_mgmt.conf file (86 in this example) in order for this to work. Due to an open issue (https://github.com/ntop/ntopng/issues/2117) users must be very cautios when configuring blocking policies in this mode as they will affect the management interface as well and possibly block management access. See management for a detailed description of how the network configuration is handled by nEdge. Neither the CaptivePortal nor the DNS enforcement is performed in this mode. In order to set up nEdge to be fully transparent, which means that it won’t alter network traffic but only provide a pass/drop verdict for client packets, some care should be taken. Make sure the Enforce Global DNS is disabled from the DNS settings page. Disalbe the Captive Portal the can alter packets in order to perform devices authentication. Other ethernet protocols (like PPPoE) are blocked as nEdge does not handle them.